I received an email from Kristen Browning-Blas, food editor for The Denver Post, the other day asking permission to use my Muffuletta recipe at the Denver Post website, I said of course. Here is the article about Serio’s Po-Boys & Deli. As I browsed through the pics and recipes I realized I needed to have a Muffuletta as soon as possible, so Anna and I headed over to Ventimiglia’s Italian Market, here in the Detroit area, to gather the necessary ingredients. But of course, as I’ve mentioned in the past, Muffuletta Bread is not to be found here in the Detroit area, so that had to be made as well. I used my Muffuletta Bread recipe, Olive Salad recipe , my Muffuletta sandwich recipe, which I altered slightly by doubling the amount of meat and cheese, I figured what the hell, I’m going to all of this trouble, why not go the full 9. Be sure and check out Jason Perlow’s post on The Muffuletta at Off the Broiler! Previous PostGrillades and GritsNext PostHappy Mardi Gras 2008! I have to tell you–your recipe is the best! I was actaully craving a muffuletta over the weekend (more so, my wife was craving the bread). It came out great! Thank you so much for sharing it! Gawd.. I really do love muffulettas. I think you just gave me an idea of what to pack for lunch. Thanks! You need to try muffulettas at DiMartino’s on DeGaulle, Nor-Joe’s next to tracks in Old Metairie, and (if it ever comes back) Andrea’s on Transcontinental just past W. Esplanade. I used to like the Napoleon House’s, but had some mediocre muffs after the storm a couple times. Is there a good muff anywhere Uptown? Yes, the same Dianne who took you to task for historical innacuracies a few months back. Your bread makes up for any and all sins past and present! I don’t have a bread machine or even a stand mixer, so I made it entirely by hand. Couldn’t believe how silky the dough felt, or how good the loaves were. The ratio of bread to all-purpose flour gets the gluten content just right! Thanks for all the work arriving at this, and for sharing it, too. I have been searching for years for authentic New Orleans recipes. I feel totally blessed to have found your site this year. Made the Muffuletta Sandwich for Fat Tuesday and it was incredible. Brought back memories of our honeymoon in New Orleans 11 years ago. The bread was great, the olive salad is to die for. Can’t wait to try many of your other recipes. Thank you again for the wonderful site. Can’t wait to try the muffuletta bread recipe! 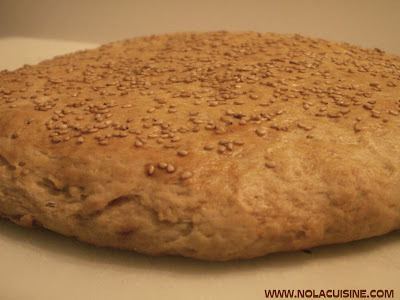 Any update on a po’ boy bread recipe? I’m finally living in Louisiana where I can buy it, but I’d love to be able to make it myself. Cant wait to try the muffaletta recipes and loving all the gorgeous pics. Serio’s was my go to place for lunch the 2 years I live in NOLa attending Tulane at its downtown campus (the Texaco building now stands derelict post-Katrina). I went to the location across the street from Charity Hospital… Monday – Thursday was a Roast Beef Po’boy dressed all the way… Friday was shrimp po-boy, also dressed. Occasionally, I’d mix it up with a smoked sausage po’boy. Granted, this was all over 20 years ago… but still a really important part of my life.